Get My Falling in Chocolate Creation® Today! Scottsdale, AZ, February 10, 2017 – Cold Stone Creamery® is bringing back more of what customers LOVE with the return of its popular Fudge Truffle Ice Cream, just in time for Valentine’s Day. The rich and decadent Fudge Truffle Ice Cream is the way to any chocolate lover’s heart. Made fresh in stores in small batches, this creamy treat is a sweet way to share the love and also comes in a delicious Creation™. The Falling in Chocolate™ Creation is made with Fudge Truffle Ice Cream, Brownie, Fudge and Whipped Topping. What makes that rich chocolate fudge so craveable? Well, chocolate contains compounds that increase excitement and happiness! All across the globe, we love eating chocolate and often just can’t get enough of this sweet treat. Whether nearly pure cocoa or in a bar loaded with milk and sugar, the smooth tasty treat can leave the consumer feeling warm and fuzzy all over. So, why does chocolate have that affect? Due to its composition, it actually affects the level of endorphins in the brain. Chocolate, as we know it, is typically comprised of cocoa solids, cocoa butter, possibly milk fat and sugar. But it’s not the milk fat or sugar that leaves us feeling so good, it’s the cocoa solids which come from the seeds of the Theobroma cacao tree. Believe it or not, these cocoa solids naturally contain small doses of stimulants like caffeine, theobromine, and phenylethylamine that leave us feeling alert, euphoric and happy. Research has also suggested that chocolate contains a so-called “feel good” chemical known as anandamide. As humans, we naturally have anandamide in our brain, but consuming chocolate increases the levels and can increase the likely hood of the production of dopamine, which of course leaves us feeling great! However, these stimulants are in such small amounts that this “chocolate bliss” only last for a short period of time. So whether it is in a chocolate bar, truffles, or your favorite Cold Stone Creamery ice cream, there are pretty good reasons why we keep going back for more! The Cold Stone Creamery Falling in Chocolate Creation™ will be in Cold Stone Creamery stores until February 28, 2017. Cold Stone Creamery gift cards make the perfect Valentine's gift for friends, neighbors, teachers, and that special someone. Gift cards can be purchased in store or online at www.ColdStoneCreamery.com/giftcardsretail. 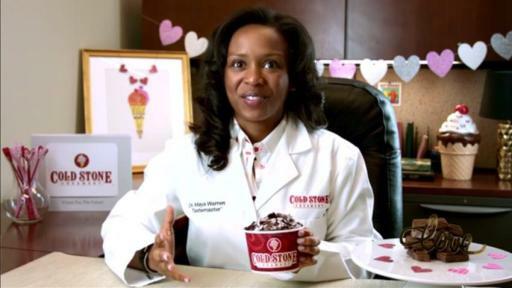 Cold Stone Creamery delivers the Ultimate Ice Cream Experience® through a community of franchisees who are passionate about ice cream. The secret recipe for smooth and creamy ice cream is handcrafted fresh daily in each store, and then customized by combining a variety of mix-ins on a frozen granite stone. Headquartered in Scottsdale, Arizona, Cold Stone Creamery is owned by parent company Kahala Brands™, one of the fastest growing franchising companies in the world, with a portfolio of 18 quick-service restaurant concepts. The Cold Stone Creamery brand operates approximately 1,500 locations in over 28 countries. For more information about Cold Stone Creamery®, please visit www.ColdStoneCreamery.com. For more information about Kahala Brands™, please visit www.KahalaBrands.com.